Berkeley Hall School Announces February 16th Event With Artist Alex Cook And His "You Are Loved" Mural Project. 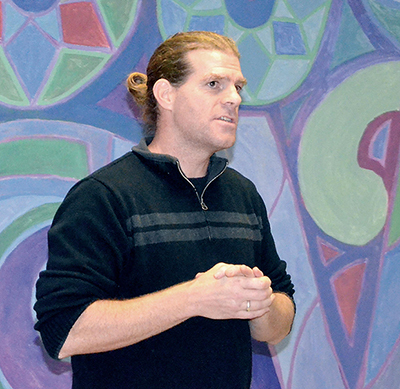 Berkeley Hall School and the Life Changes Network bring artist and social activist, Alex Cook, to the Berkeley Hall campus the week of February 15th as part of their Difference Makers Series. Alex will be designing and painting a beautiful on-campus mural with Berkeley Hall School students communicating the enduring messages of love, joy and peace. Please join us to hear Alex discuss how art is a key tool for communicating and sharing the deeper meanings of life, how art can serve as a unifying force for good in the world. On Tuesday, February 16th, artist Alex Cook will be giving a talk about the exciting and uplifting mural art project he will be orchestrating with Berkeley Hall School students and family members over the period of a week. The talk will take place in Hodge's Theater at 2:10 pm. The event is open to the public. "Alex will acctually begin working on campus starting Sunday, Valentine's Day," says Mark Laisure of the Life Changes Network. "This is perfect because the name of his organization is 'You Are Loved'. He is even inviting student family members to join in on the love and paint with him on Monday, February 15th - a school holiday." This is the first scheduled Difference Makers Series event of 2016. According to Berkeley Hall School's Head of School, Dr. Lisle Staley, the purpose of the Series is "to invite guests from a wide variety of professional and personal backgrounds to engage our community in significant, thought-provoking, interactive and inspiring conversations. The series features speakers of high ideals and strong character whose insights, ideas, accomplishments and/or life stories have made a major positive impact on our times. We are very honored to have Alex Cook spend an entire week with us, bringing our students together through art and leaving our campus with a lasting image of peace, joy and love." Alex Cook is a multi-disciplinary artist living in Boston, MA. Since 1997 he has created over 110 murals in the US and abroad. 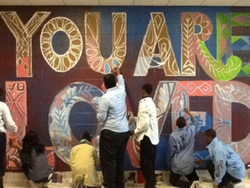 In 2014 he created the YOU ARE LOVED Mural Project, collaborating with schools and organizations of all types to artfully express that important message. Says Alex, "The public conversation about worth, value, and well-being is often dark. 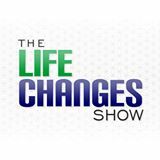 We are surrounded by belittling messages of materialism, bullying, and violence. The five messages I leave students with in their murals are: You are Loved, You are Needed, You are Important, You are Beautiful and You Can Do It!" Founded in 1911, Berkeley Hall School is a Nursery-8th grade independent school nestled on 66 acres of natural beauty in Los Angeles, California, The school's mission is to "empower children to fulfill their unlimited, God-given potential as fearless scholars and conscientious citizens."